AfriCali is a California-based creative “collaborative in sound” inspired by South African born MC/vocalist Eyezon. 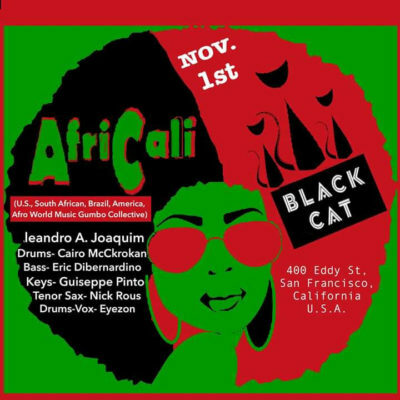 Africali encompasses a unique blend of jazz, soulful rock, blues, heavy rhythms & percussion of 1970s African music, topped with coastal-psych seasoning. They have a sound that embodies the meaning of Afro-fusion. The most interesting thing about AfriCali is that it lends importance to the instrumentation as much as it does the vocals, while the melodies of each instrument and voice develops in episodes, as opposed to the familiar verse-chorus format. What is astounding about this piece is it’s absolute ground-breaking fusion of innumerable elements. About as experimental and open-hearted as music gets, the endless interweaving of various keyboard, guitar sounds, vocals, and evolving percussion, equals a masterpiece in any terms. Africali has toured with musicians from different styles and musical backgrounds, like former label mate K’naan, Stephen Marley, members of Fela Kuti, and Hugh Masekela. They’ve played festivals such as Harmony Festival, One Love One Heart Reggae Festival, Nacarubi Fest, Fillmore Jazz Fest, Eagle Rock Music Festival, Soul Play, and more. Their debut album Taught Of A Culture, released last October by German indie Label Tokyo Dawn Records, has gotten raving reviews and major radio support via UK&s BBC, KCRW, and college radio across the country. Click HERE to listen to AfriCali!